Assassin's Creed Undertunic - Large/Extra large - this item is on closeout at a 40% discount, once these are gone they will no longer be available. Do you know why Altair is such a good assassin? (And "because they programmed him that way in the video game" is not the answer we're looking for.) It's because of his attention to detail. Do you want to know why he looks so cool (Again, same caveat)? because his outfit is completely coordinated. You want to be like Altair? Then don't skimp. get the whole outfit. See his picture over there? See the grey arms sticking out from under his overtunic? That's the undertunic. 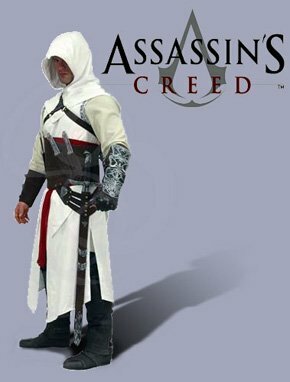 This fully licensed under-tunic is from Assassin's Creed and worn by Altair the Assassin. His long sleeve under tunic is a soft gray and made of 100% cotton. Coordinates with the Altair Over Tunic with Hood. Choose from sizes S/M or L/XL.